London at one time was the largest port and industrial city in the world. Bermondsey, Deptford, Blackwall and Greenwich were all major centres for shipbuilding. This lecture will look at the industrial river and consider the changing needs of shipping with the transition from sail to steam and its impact on London as a port. 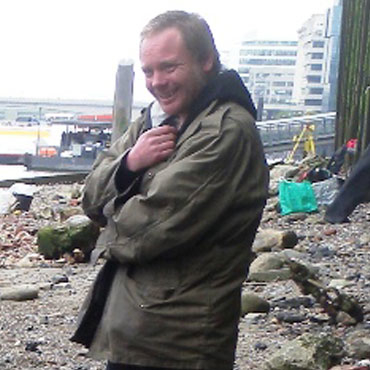 Elliott is Project Officer at the Thames Discovery Programme, Museum of London Archaeology. He is also a Trustee Director of the Nautical Archaeology Society. The almost deserted River Thames of today, plied by pleasure boats and river buses is a far cry from its recent past when London was the greatest port in the world. Today only the remaining docks, largely used as mooring for domestic vessels or for dinghy sailing, give any hint as to this illustrious mercantile heritage. This story, however, is fairly well known. What is less well known is London’s role as a shipbuilder While we instinctively think of Portsmouth, Plymouth and the Clyde as the homes of the Royal Navy, London played at least an equal part as any of these right up until the latter half of the 19th century, and for one brief period was undoubtedly the world’s leading shipbuilder with technological capability and capacity beyond all its rivals. Little physical evidence of these vast enterprises is visible behind the river wall but when the tide goes out the Thames foreshore gives us glimpses of just how much nautical activity took place along its banks. From the remains of abandoned small craft at Brentford and Isleworth to unique hulked vessels at Tripcockness, from long abandoned slipways at Millwall and Deptford to ship-breaking assemblages at Charlton, Rotherhithe and Bermondsey, these tantalising remains are all that are left to remind us of London’s central role in Britain’s maritime story. This paper will first trace London’s pre-eminence in the days of the wooden walls before looking at how London’s shipbuilders managed and, in many ways, led the technological revolutions in shipbuilding of the 19th century, form sail to steam and from wood to iron and steel. And yet, having achieved unrivalled global leadership by 1860, barely fifty years later a thousand year old industry had collapsed entirely. How was such world leadership achieved and why did it fall apart in such a short period of time? Although King Aethelstan of Kent fought the first known successful English naval action off Sandwich in 851 defeating Viking raiders, Alfred the Great is widely credited with creating the first English navy and with some justification, creating an integrated defence system comprising fortified towns or burhs, a mobile army and a fleet of ships both larger and faster than the Danes; a system that was good enough to have secured Wessex and London by the turn of the 10th century and allowing his son and daughter, the indomitable Edward the Elder and the Lady Aethelfaeld, to reconquer much of what is now England and begin to establish suzerainty over much of Scotland and Wales. Their successors Aethelstan, Edgar, Aethelred II, the Danish Cnut and the Anglo-Norman Edward the Confessor all used the English (in the later period Anglo-Danish) fleet extensively to create English overlordship over the countries bordering the British Isles and the Irish Sea and to deter external attack, whilst also using it as a tool in continental diplomacy somewhat in the style of the Victorians. It is of course true that Aethelred lost his throne to Cnut but internal divisions may have played a substantial part in this debacle. More importantly, by this period a naval administration had been set up linking terrestrial administrative areas, the ‘hundreds’ and the ‘ship sokes’, with support for the fleet. In 1066, after the death of The Confessor and the accession of Harold Godwinson, William of Normandy waited with his invasion force (not for a wind as his propagandists would have had us believe) until September when Harold raced northward to defeat the Norwegians at Stamford Bridge and the English fleet retired from the Isle of Wight to London to re-supply on the 8th of that month. Facing no opposition, William sailed, his successful landing and subsequent land victories sealing the doom of Saxon England. How does this all relate to London as a centre of shipbuilding? It is hard to say, although London by the 11th century was the largest town in England and it is clear from documentary sources that it was a centre for fleet supply, certainly when the threat was off the south and east coasts. Archaeological evidence for London shipbuilding in this period is sketchy- re-used nautical timbers have been recorded in waterfront structures while the finding of unused roves are clear evidence of ship repair at the very least. Street name analysis, however, does imply a shipbuilding industry- indeed it would be strange if such capacity did not exist. Given that the later Saxon monarchs, having realised the potentialities of naval power, seem to have based themselves predominantly in London and appear to have seen it as the rallying point in time of war, it takes not a massive stretch of the imagination to suggest that it was the epicentre of Saxon sea-power. With the exception of Henry V (and possibly Richard I) subsequent Medieval monarchs seemed to have had no conception of sea power as a strategic and diplomatic instrument and allowed the mighty Saxon fleet to wither and die. In the main they seem to have seen ships as useful in supplying their plodding armies in coastal campaigns rather than as a weapons delivery system able to achieve strategic surprise at great speed. As such they tended to take ships up from trade as required- the great Medieval sea battles such as Sluys in 1340 being largely fought by merchant vessels modified with castles fore and aft. It is no surprise that the greatest and most successful Medieval King, Henry V, was the only one to create and maintain an effective Royal fleet. Amidst the chaos of the subsequent Wars of the Roses it is striking that the maverick Earl of Warwick, the ‘kingmaker’, was Captain of Calais and used his squadron to great effect for whichever side he happened to support at the time. A pattern which would be emphatically repeated in the 17th century. In this period the somewhat ephemeral evidence suggests a growth in London’s shipbuilding capacity, ribbon developments eastward through modern Wapping, Ratcliffe, Limehouse, Blackwall, Bermondsey, Rotherhithe and Deptford presumably linked to shipbuilding and ship supply- Royal galleys are known to have overwintered on the Greenwich marshes at this time. While Henry VII established the first Royal Dockyard at Portsmouth either in 1492 or 1496, his son Henry VIII created new establishments at Deptford and Woolwich- suggesting a skilled labour force was in existence. Very soon the London yards were building the greatest ships of this ambitious renaissance prince- the Henri Grace A Dieu being launched at Woolwich in 1514. Much more importantly, it is in Henry’s reign that the rudiments of naval administration, certainly with regards to maintenance and supply, begin to reappear; a foundation that would prove vital as the isolation and vulnerability caused by his inept foreign policy required that a naked nation riven by religious turmoil could only possibly defend itself by sea. The days of England as a continental military power were emphatically over. Henry’s successors inherited a poisoned chalice- not until 1688 did the ramifications of his reign finally resolve into something approaching the relatively stable parliamentary democracy (actually a commercial oligarchy) that we know today. For a while England was a satellite of Spain whilst Phillip II was married to Queen Mary and Catholicism was brutally re-imposed. After, in the reign of Elizabeth I, an impoverished and isolated, almost pariah, kingdom attempted to punch above its weight, pretending peace whilst tolerating and financing buccaneering expeditions against the all-conquering Spanish. The focus now was on ships; John Hawkins made his famous deal with the government to maintain the navy whilst Mathew Baker was developing the new race-built galleons such as the Ark Royal built in a private yard at Deptford in 1587. London now became, if it had not been before, the crucial fulcrum of the nation’s safety, the Royal Dockyard at Deptford being heralded as ‘the cradle of the navy’, also being the site of Sir Francis Drake’s knighthood and the lying in state of the Golden Hind as the first naval icon of a country fast learning its priorities. The Spanish Armada of 1588 was successfully deflected, at least 34 London ships taking part in the somewhat unsatisfactory whilst ultimately successful campaign, while during the Spanish war as a whole London ships took more booty than those of Devon, Cornwall, Bristol and Bridgewater combined. Throughout the succeeding years London continued to be at the forefront of shipbuilding; James I’s great ship the Prince Royal was launched at Woolwich Dockyard in 1610 whilst his son Charles I’s spectacular Sovereign of the Seas slid down the same ways in 1637. Despite his naval expenditure the sea service largely supported parliament in the civil wars, primarily it would seem on religious grounds, thus ensuring parliamentary victory. In 1660, after the death of the military dictator Cromwell (whose own prestige ship the Naseby was launched at Woolwich in 1655), the navy blockaded London and ensured the restoration; the period of the civil wars and protectorate forming an interesting study into the relative merits of naval and military power. While Charles II and James II were undoubtedly the most naval minded monarchs in our history their inclination towards Catholic absolutism and rather ham-fisted use of the magnificent fleets they had created, and in James’ case fought with conspicuous courage, led to the so called ‘Glorious Revolution’ of 1688. Yet again many naval officers demonstrated independent political views (and others much hesitancy). Lord Dartmouth, the fleet commander, was unable to intercept a lumbering invasion force from his anchorage in the Gunfleet, the last successful invasion of these islands ensued and James fled. The subsequent wars of the second invasive William and his successor Anne, particularly the disaster of the Smyrna convoy in 1693 and the later French guerre de course, began to impress upon an increasingly merchant dominated parliament that the Navy’s essential task was to protect by convoys and cruisers the vital trade which so enriched them, and the nation itself from invasion by engaging an enemy’s main fleet wherever found- an at this stage still evolving strategic vision which was to mature and subsequently endure, with hiccoughs, until after the Second World War. During the eighteenth century, particularly through the efforts of First Lord of the Admiralty Lord Anson and his later successor the Earl of Sandwich, this strategy combined with technical advances such as the coppering of ships’ bottoms, better quality flintlock-fired cannon and the introduction of close range carronades, and the aggressive instincts and tactical appreciation of commanders such as Hawke, Rodney, Howe, Hood, Jervis, Duncan and Nelson (along with the collapse in French naval competence caused by the revolution), to create the heroic period of the Royal Navy through the Seven Year’s War (1754-1763) and American War of Independence (1775-1783) and into the French Revolutionary (1793- 1802)and Napoleonic Wars (1803-1815). We have already seen that as early as the 16th century London’s Royal Dockyards were producing first rank prestige warships such as the Henri Grace a Dieu, whilst her private yards were equally capable of launching ships of similar quality like the Ark Royal. By the later eighteenth century the Royal Yards in London were finding it increasingly difficult to launch the largest ships such as first and second rate three decked ships of the line due to the shallow nature of the Thames, and in wartime were massively preoccupied in fitting ships in reserve for active service and regular fleet maintenance- when the French entered the American War of Independence it took the best part of a year to fully mobilise the fleet. The Navy however was (by the later eighteenth century) dominated by third rate two decked ships of the line with 74 guns, fast frigates and a multitude of smaller vessels which Deptford and Woolwich could still produce. Equally London’s private yards at Rotherhithe and Deptford, at Limehouse and Blackwall (the largest shipbuilding establishment in the country and possibly the world at that time) were more than capable of constructing these vital sinews of war. Lower down the Thames Estuary and in particular in the Medway, the Royal Yards at Chatham and Sheerness and private yards at Northfleet, Strood and Rochester were also making a major contribution. In order to appreciate the dominance of the Thames in creating Nelson’s Navy it is worth looking in detail at the fleets he commanded at his three great victories; the Nile in 1798, Copenhagen in 1801 and Trafalgar in 1805. At the Nile, of his eleven ships, three were built at Deptford Royal Dockyard and one at Woolwich, three more were built in private yards at Deptford, two at those in Rotherhithe and one at Blackwall- 79% of the total. A further two were built each at Chatham Royal Dockyard and privately at Rochester meaning that all but one of his ships was built on the Thames or its tributary the Medway. At Copenhagen, out of twelve, two were built in London’s Royal Yards, four more were built in the private yards (50% London built), whilst a further four were built downstream in the Estuary. At Trafalgar four of his twenty seven ships were built at Woolwich or Deptford Royal Yards, a further five were built privately at Rotherhithe or Deptford (33% London built), while seven were built lower down the estuary giving a Thames-built percentage of 63%. Once one considers that two of his ships were French prizes that increases to 68%. Over the three battles (and bearing in mind that some ships served in more than one engagement), of the cumulative forty eight British built ships engaged, ten were built in London’s Royal Dockyards, fifteen were built in London’s private yards, while the lower Thames contributed eleven. These give a percentage for London at 52% and the Thames in its entirety at 75%. Not only was London just building warships however, the great yard at Blackwall was also launching East Indiamen and other commercial shipping at a high rate; the other private yards being by no means idle. While it is presently much more difficult to quantify this aspect of London shipbuilding- considerably more documentary research is required- it seems clear that London was the pre-eminent shipbuilding centre of the age, followed at a distance by the lower Thames yards. It has been mentioned above that technological advances had aided the Royal Navy during this period. Further advances however, more radical than the vast majority of those fighting at Trafalgar could possibly have imagined, were already starting to take place. How would the greatest shipbuilding industry in the world cope with the massively fundamental changes already afoot? While the industrial revolution was gathering pace, the first shipbuilding revolution of the nineteenth century was almost invisible. Sir Robert Seppings, Surveyor of the Navy 1813-32, introduced new diagonal internal framing and iron knees while remoulding bows and sterns to strengthen and stiffen the ships; thus allowing them to increase in size and power. Of greater long term significance was an entirely new form of propulsion- a form of propulsion in which London, after a hesitant start, would play a starring role. Steam engines, notably developed by Watt and Newcomen, had been pumping water out of mines long before Trafalgar but in 1788 Robert Burns is known to have cruised in a small steam paddle boat on Dalswinton Lake, Dumfriesshire. The Charlotte Dundas, a successful paddle boat of 1802 built by William Symington to ply the Forth-Clyde Canal was rejected by the canal owners for fear of damaging the banks with her wash; similar developments were underway across the Atlantic, the first commercially viable steam vessel operating on the Hudson River by 1807. In 1812 Henry Bell’s Comet commenced a service on the Clyde while by 1815 five steamers were cruising the Thames and regular steam cruises up and down the East coast of Britain were starting to lose their novelty. Sailing ships with auxiliary steam engines had begun making transatlantic voyages, west to east (with the prevailing wind), from 1819. This pioneering work was largely accomplished by Scotsmen and Americans (and even the dreaded French had been involved!). What on earth were the greatest shipbuilders on the planet doing? They were waking up and smelling the steam. In 1833 the Blackwall built Cape Breton made the first east to west steam assisted transatlantic crossing against the prevailing wind. Simultaneously they were making major advances in marine engineering such as Samuel Hall of Bow’s introduction of condensers allowing fresh water rather than corrosive seawater to enter boilers in 1834. A further improvement came in 1837 when Seaward & Capel of Millwall developed a direct action engine giving more effective power to the paddles. Only two years later at Lambeth, Joseph Maudslay patented the first twin cylinder engine. Paddle wheels were, however, not very efficient in a seaway- to really harness the potential of steam power a new propulsion system needed to be found. In 1838 Francis Petit Smith’s Archimedes was launched at Ratcliffe Cross Dock, with engines built by J. and G. Rennie of Millwall. With a revolutionary screw propeller rather than paddle wheels she was lent to Isambard Kingdom Brunel in 1840 for experiments, he concluded that screw propulsion was the way forward. Yet again, London shipbuilding had indicated the future, a lesson that Brunel was not to forget. The United States, during the War of 1812, had ineffectually attempted to put the Demalogos, potentially the first ever serviceable steam powered warship in the world into service. The first steam powered vessel for the Royal Navy was the paddle tug Comet launched at Deptford Royal Dockyard in 1822, yet it took eight further years for an armed paddle steamer, the Dee, to be ordered. Before this, in 1821, the Sovereign had been launched in London as a Post Office mail packet. At this stage naval engine maintenance was carried out privately by Boulton and Watt of Birmingham and Henry Maudslay of Lambeth; the Admiralty recognising the inevitable by 1830 when in house facilities had been opened at Portsmouth and Woolwich, the latter dockyard going on to specialise in marine engineering for some decades. After the famous tug of war between the Rattler and Alecto in 1845 the Admiralty resolved upon screw propulsion – particularly sensible in that vulnerable machinery would be below the waterline whilst a full broadside battery could be mounted. The first of the screw propelled line of battleships, the Agamemnon, was launched at Woolwich Royal Dockyard in 1852, the yard by this time earning the soubriquet of ‘the home of the steam navy’. One or more of three similar ships designed for screws; either the Hannibal launched at Deptford Royal Dockyard in 1854, the Edgar launched at Woolwich Royal Dockyard in 1858 or the Anson launched in 1860 at the same location share some of their bones with those of the then largest warship in the world the Duke of Wellington. Launched in 1852 at Pembroke Dock after being cut in half on the building stocks for the insertion of a steam engine, she was not a success, being almost instantly outclassed by Warrior and her consorts (see below), and was broken up at Charlton with the aforementioned ships in 1904/5. While Seppings’ structural improvements allowed an increase in size of wooden vessels, the frigates Orlando and Mersey of 1858 being 300 feet long; both powered by London built steam engines, Penn (Greenwich) and Maudslay (Lambeth) respectively, there were natural limits to wooden hulls. In a seaway vessels are subject to conflicting pressures due to the distance between wave troughs and peaks- and the larger the vessel the greater the pressures, leading to continuous hogging- where the central part of the ship is pushed up, and sagging- where the reverse occurs. Furthermore, the adoption of screw propulsion added additional stress to a wooden hull both by vibration and by directing all the kinetic energy upon a single point aft. Equally, quality shipbuilding timber was becoming increasingly scarce and expensive whilst iron was becoming cheap and plentiful- in 1830 700,000 tons of pig iron were produced in the UK, by 1839 the supply had more than doubled to 1,700,000 tons. The solution to all of these problems was to build in iron. London of course was in the vanguard of this constructional revolution, the Aaron Manby of 1821, built in sections at Tipton in the West Midlands but assembled at Rotherhithe, being the first iron vessel to cross the Channel. Brunel, having studied the Archimedes, built his second ship, the Great Britain, floated out of a Bristol dry-dock in 1843, as an iron hulled screw steamer (with a Penn engine), neatly solving the aforementioned problems. At 3,674 tons displacement and 322 feet in length she was the largest vessel of her time, yet soon to be dwarfed by Brunel’s next nautical project- a ship so ambitious in concept, so advanced in technology, and so gigantic that only one place in the world would be capable of her construction. It is very odd to write in consecutive superlatives but sometimes one has no choice. The Great Eastern was possibly the greatest engineering achievement of the Victorian age. Conceived as a ship that could travel to Australia without stopping to take on coal, she had to be enormous in order to carry the massive quantities of fuel required in those days of low performance engines, resulting in a hull 692 feet long, a beam of 82 feet and a fully loaded displacement of 32,160 tons; dimensions that would not be exceeded for forty years. From 1856 until 1857 this great behemoth had been slowly rising to dominate the Millwall skyline. London waited. On the 3rd of November 1857 the great day came. Against Brunel’s wishes sightseers were let in to enhance his humiliation when the great ship held in its two cradles refused to move sideways down to the river along his specially designed slipways. The crowds laughed and left. For the next three months extraordinary attempts were made to pull, bash and bludgeon the leviathan into the river until, on the 31st of January 1858, she finally took to the water, battered down the ways by the best hydraulic rams that Birmingham could produce. Of course Brunel was a fantastic engineer and visionary; he was not however an archaeologist. Had he been so, he might have considered the prehistoric peat layers underlying the foreshore surface- not the most stable deposits in the world and easily compressible; this lack of stability leading to his great ship jamming as soon as it moved down the slips. While the merchant marine was appreciating the benefits of iron ships, the Admiralty were less impressed; early iron plate being easily shattered by round shot. They carried out tests of armour plate at Woolwich 1856-8 and despite the results were happy to let sleeping dogs lie- Britain’s industrial and shipbuilding preponderance being such that any foreign developments could be dealt with as and when they occurred. The success of the French armoured floating batteries at the bombardment of Kinburn in 1855 led them to launch the wooden-hulled but armour-plated frigate Gloire in 1859- this did require a response. The Admiralty made the technological quantum leap of deciding on an iron-hulled armoured frigate and, like Brunel, looked to London to build their revolutionary ship. Thames Iron Works of Blackwall launched Warrior in 1860. Displacing 9,137 tons and with an overall length of 420 feet, she totally outclassed the Gloire and made every other warship afloat instantly obsolete. Dickens wrote of her as ‘A black vicious ugly customer as ever I saw, whale-like in size, and with as terrible a row of incisor teeth as ever closed on a French frigate’ whilst another commentator referred to her as ‘a black snake amongst rabbits’. Over the next six years, out of nine armoured successors to Warrior built for the Royal Navy, Thames Iron Works launched the Minotaur in 1863, Westwood and Baillie of Millwall built the Resistance (1861) and the Valiant (1863), Samuda of Poplar the Prince Albert (1864), and Millwall Iron Works the Northumberland (1866). No other city in the world could have created the two most revolutionary vessels of the century within the space of two years, furthermore by 1866, London had built 60% of the Navy’s first rank warships- a better proportion than in the days of Nelson. Both in technological capability and sheer capacity, London had the most successful shipbuilding industry in the world. Behind the façade of these incredible achievements however, all was not rosy in the garden of London’s shipbuilders. The distance of London from the sources of shipbuilding material, the lack of room for expansion caused by London’s extraordinary growth in size during the 19th century, and the confined nature of the Thames (the launch of the Great Eastern being the exception that proves the rule) were systemic problems as yet not fully realised. Many smaller yards had speculatively built gun boats for the Navy during the Crimean War and, on peace in 1856 found that they had no buyer and went under. In most cases their stock was bought up by their larger competitors who, as we have seen above, were about to build the most advanced vessels in the world. The collapse of the bank of Overend, Gurney and Company in 1866 caused a run on the markets and severely affected London’s shipbuilders. Mercantile buyers never again ordered ships of significant size from London’s yards, whilst the Royal Navy itself was also starting to look elsewhere. The Royal Dockyards beyond London had been radically improved and could now build the most modern vessels- Achilles being launched at Chatham in 1863. Deptford Royal Dockyard had been effectively mothballed in the 1830’s (reopening on a smaller scale in the 1840’s after steam dredging had deepened the Thames), whilst Woolwich at the same period was largely concerned with marine engineering as discussed above. Both Dockyards closed in 1869, ‘the cradle of the navy’ and ‘the home of the steam navy’ were no more. The prestige of building Great Eastern and Warrior was still a great factor- certainly to foreign governments, and it was their warship orders which helped to keep the industry going. During the period 1868-1888 Thames Iron Works launched ten ships for the Royal Navy (48,800 tons) and thirty four for foreign navies (36,068 tons), whilst launching forty five mercantile vessels for Britain and the Empire (12,776 tons) and twelve for foreign buyers (3,208 tons). The numbers sound impressive (I am indebted to Andrew Choong Han Lin of the National Maritime Museum for these statistics) but the tonnage tells a different story: the naval orders average out at just under 2,000 tons per ship while mercantile building works out at 280 tons per vessel. The London yards were now effectively building either battleships or barges- not necessarily what a sensible business plan might suggest- and with predictable effects. No longer either did London have its previous technological edge, the introduction of steel shipbuilding (Edinburgh launched at Pembroke in 1882 being the first largely steel-hulled British battleship) further tilted the scales against them. Despite this, new yards, Thorneycroft at Chiswick and Yarrow at Poplar specialised in small fast ships- destroyers, the very first of these, the Havock, being launched by Yarrow along with the Daring by Thorneycroft in1893. Within fifteen years however, both firms had relocated outside of London- in Thorneycroft’s case the somewhat immovable object of Hammersmith Bridge was a significant factor in the decision. Thames Iron Works alone soldiered on, increasingly desperate to try to recreate the glory days by bidding for prestige projects such as the super-dreadnought Thunderer of 1911. At 23,000 tons full load displacement and 581 feet long, she was as fine a ship as London had ever built. Unfortunately she was the last; the banks refused to honour the cheques of the company, the receivers came in and the yard closed in December 1912. For almost exactly a millennium, London built ships. Those ships had been the fulcrum of Saxon power, had played a significant role in the Armada campaign and the Civil War, and had made up half of the fleets that Nelson commanded in his great victories. At the midpoint of the 19th century she had already made, through her shipbuilders and marine engineers, a massive contribution to the most extraordinary revolution in shipbuilding history, and then built, within two years, Great Eastern and Warrior- ships so significant that they are unlikely to ever be forgotten. Warrior, now lying at Portsmouth, restored to her former glory as though she had just departed from her Blackwall slipway, stands as a monument to generations of London shipbuilders and to the city who built her. I am extremely indebted to Gustav Milne of UCL’s Institute of Archaeology and MOLA for his advice on the archaeological evidence for early Medieval shipbuilding in London, and equally so to Andrew Choong Han Lin of the National Maritime Museum for his insight into the causes of the collapse of London shipbuilding and his statistical analysis of Thames Iron Works vessels in the later 19th century.